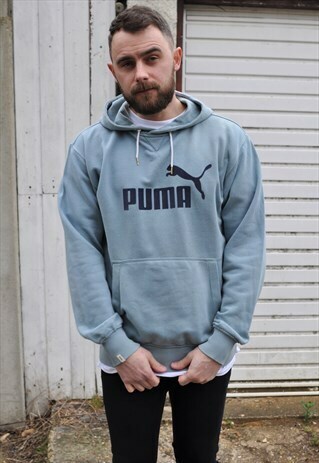 This vintage Y2K Puma logo hoodie is a great addition to your wardrobe. It's lightweight and perfect for layering up now in the transitional months. It has some great details like the classic logo and mint green colour. As it's vintage there may be some signs of natural wear, tear, bobbling and age but overall this hoodie is in good condition. Any flaws are reflected in the price. It's labelled as a size Small and our model is a medium build and 5ft 9. For exact measurements please check the sizing details. Measurements in inches laid flat - Chest - 24" Length (shoulder to hem) - 29.5" Sleeve length (armpit to cuff) - 24.5"